Are you looking for a great family movie adventure this weekend? You don't even need to leave the couch to be transported to Europe with Alex, Marty and the rest of the Madagascar 3: Europe's Most Wanted cast! All of our favorite characters, including the Penguins, are back in the mix - and they're conquering Europe by Circus! We watched it as a family and the boys absolutely loved the antics and adventure! The circus theme was a great hook and the boys found both the characters and the storyline fun and it kept their attention - which is pretty big for my six and two year old! I personally love that the combo pack came with a digital download so that we could add it to our iTunes library and the boys can watch Madagascar 3 on the ipads too! 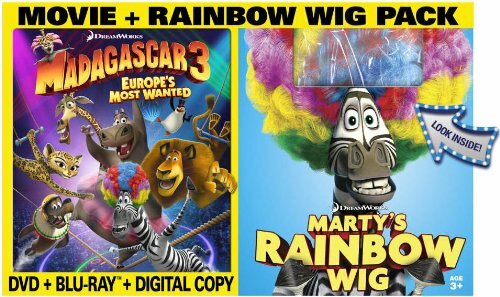 Erik rocked Marty's rainbow wig for just a few minutes .. but it was a great addition to the combo pack! As an adult watching the movie, there were definitely some plot holes... enough to drive a small SUV in... but there were enough 'adult' moments and gags that I stayed interested too! And now, check out some great travel tips from Marty & Alex! Having just crossed Europe in their latest adventure, Alex the lion and Marty the zebra offer some expert travel advice for anyone planning to take in the sights of the Continent. And even if you’re not heading to Europe any time soon, you can enjoy the Zoosters’ uproarious antics in Madagascar 3: Europe’s Most Wanted on Blu-ray™ and DVD now! Alex: If I had to choose between car, train or plane travel, I’d choose the train, but that’s probably only because we had some, well, mishaps in the car and plane. In general, I recommend any mode of travel without a penguin or lemur on board. That said, a car can be a great way to get off the beaten path…but whatever you do, don’t let the zebra drive. Marty: Planes, trains and automobiles will get you where you need to go, but they don’t even come close to being shot out of a cannon. It’s the only way to fly! I definitely recommend cannon if you’re in a hurry. Or a candy gram! Ooooh, I’m gonna try that next. Alex: I personally like to travel light. Light and limber, that’s my motto. Of course the obvious exception is hair conditioner. You can never carry too much hair conditioner, especially when a certain zebra has a habit of drinking it. Marty: We made it half way across Europe with nothing but our wits…I would not recommend it. I say pack everything because you never know how long it’s gonna be before you get back home. Trust me. And I always bring an extra bag so I have room for souvenirs… like those little bottles of shampoo—they’re delicious! Melman: Hand Sanitizer, cold medicine, tissues, lozenges, toothpaste, floss, sun screen, and bottled water! I have been to some watering holes that…well let’s just say that just because a hippo tells you it’s safe to drink the water, it’s not! Especially when the water is brown, opaque and the hippo is bobbing around in it. Marty: You know what they say: “When in Rome.” I’m not really sure what that means, but when we were in Rome we barely made it out alive, so I should probably look it up. But drop me into an op art gallery and, baby, I can blend in! Wait, what does “blending in” mean again? Alex: Well, I like to think that I blend in well wherever I go because lions have a natural gift for camouflage…as long as whatever I’m standing against is sort of tan-colored. But if the people get a look at my face, it’s all over. They start screaming in adoration and then they start running away in adoration. It comes with the territory when you’re a super famous lion. Marty: Or any kind of lion, really. Marty: Not knowing where you’ll be next is exciting. I mean, one day you’re being chased through the streets of Monte Carlo at 200 miles per hour and the next you’re being shot out of a cannon in the circus! What could be better than that? Alex: How about…NOT being shot out of a cannon? Alex: Seeing the sights, trying new food, escaping capture—they’re all fantastic. But sometimes the best thing about traveling is just being with your peeps. Marty: You said it, pal. Those are some good marshmallows. Disclaimer: I received this product at no cost for the purpose of review. All opinions are my own.